McCubbin was born in Melbourne, the third of eight children of baker Alexander McCubbin (from Ayrshire, Scotland) and his English wife Anne, née McWilliams. McCubbin was educated at William Willmett's West Melbourne Common School and St Paul's School, Swanston Street. He later worked for a time as solicitor's clerk, a coach painter and in his family's bakery business while studying art at the National Gallery of Victoria's School of Design, where he met Tom Roberts and studied under Eugene von Guerard. He also studied at the Victorian Academy of the Arts and exhibited there in 1876 and again from 1879 to 1882, selling his first painting in 1880. In this period, after the death of his father, he became responsible for running the family business. By the early 1880s, McCubbin's work began to attract considerable attention and won a number of prizes from the National Gallery, including a first prize in 1883 in their annual student exhibition. By the mid-1880s he concentrated more on painting the Australian bush, the works for which he became notable. In 1883, McCubbin received first prize in the first annual Gallery students' exhibition, for best studies in colour and drawing. In 1888, he became instructor and master of the School of Design at the National Gallery. In this position he taught a number of students who themselves became prominent Australian artists, including Charles Conder and Arthur Streeton. McCubbin married Annie Moriarty in March 1889. They had seven children, of whom their son Louis McCubbin became an artist and director of the Art Gallery of South Australia 1936–1950. A grandson, Charles, also became an artist. In 1901 McCubbin and his family moved to Mount Macedon, transporting a prefabricated English style home up onto the northern slopes of the mountain which they named Fontainebleau. It was in this beautiful setting, in 1904, that he painted The Pioneer, amongst many other works, and this is the only place that McCubbin ever painted fairies. The house survived the Ash Wednesday fires and stands today as a testament to the artist. It was at Macedon that he was inspired by the surrounding bush to experiment with the light and its effects on colour in nature. McCubbin continued to paint through the first two decades of the 20th century, though by the beginning of World War I his health began to fail. He traveled to England in 1907 and visited Tasmania, but aside from these relatively short excursions lived most of his life in Melbourne. There he taught at the National Gallery of Victoria Art School, where his students included painter Hilda Rix Nicholas and the photographer Ruth Hollick. In 1912 he became the founding member of the Australian Art Association. McCubbin died in 1917 from a heart attack. "McCubbin creates an engulfing, claustrophobic landscape by barely suggesting any horizon and compressing midground and background. In contrast, the bush folk are portrayed as heroic figures." 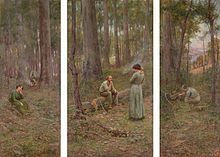 In 1998 McCubbin's painting Bush Idyll (1893) sold for $2,312,500, a then-record price for an Australian painting at public auction. On 25 February 2005, the 150th anniversary of his birth, the premiere of McCubbin: A Musical Biography of Frederick McCubbin by Peter Burgess was staged at Federation Square, Melbourne. On 22 March 2016, McCubbin's painting An Old Politician (1879), resurfaced from a private vault in an Australian bank. The painting has not been viewed in public exhibition since its sale to a private collector in the 1880s. ^ Thomas, David (1986). "Frederick McCubbin". Australian Dictionary of Biography. pp. 242–243. Retrieved 25 May 2018. ^ Pigot, John (2000). Hilda Rix Nicholas: Her Life and Art. Carlton South, Victoria: The Miegunyah Press at Melbourne University Press. p. 6. ISBN 0-522-84890-7. ^ Hall, Barbara. "Hollick, Ruth Miriam (1883–1977)". Australian Dictionary of Biography, National Centre of Biography, Australian National University, vol. 14, 1996. ^ "Rarely-seen Frederick McCubbin painting unveiled for brief viewing". ABC News. Retrieved 22 March 2016. Wikimedia Commons has media related to Frederick McCubbin. This page was last edited on 22 March 2019, at 12:31 (UTC).